Both words are transliterations in the western alphabet of one word in Arabic alphabet. There is also the redundant transliteration "Saluqi" in the English speaking countries. 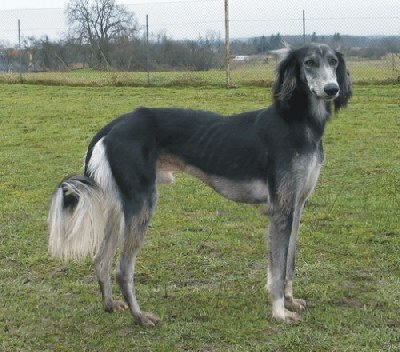 It is pronounced the same way as Saluki, and is artificially used to group all slughi/saluki breeds together into one breed, instead of a group of breeds. Engraving from L’Acclimatation, circa 1880. Slughi of the Sahara: is the breed named "Sloughi" in the Western World. It is the North African Sloughi or Sloughi of the Maghreb (Slughi moghrebi). This breed is always smooth coated. 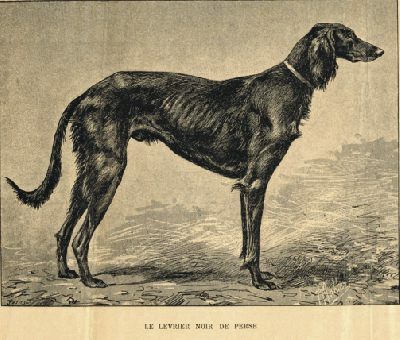 "The Black Sighthound of Persia" by P.Mahler. Engraving from L’Acclimatation. Cited as “Mesjed”, owned by Mr. J. Isfahan, Teheran, by Count Henry de Bylandt (6), 1904. 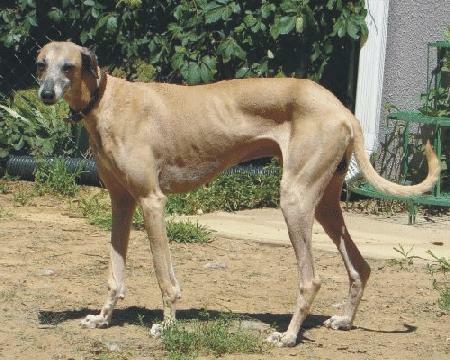 Slughi shami, yamani, omani or nedji: are the breed named "Saluki" in the Western World. All four are from the Arabian Peninsula. The Slughi shami from Syria (5) has long silky hair on its ears, back of thighs and tail. The Slughi yamani and Slughi omani, hounds of Yemen and Oman respectively, have less feathering on ears and tail. The Slughi nedji, from the region of Najd (central Saudi Arabia) has shorter hair than Slughis shami, omani and yamani. 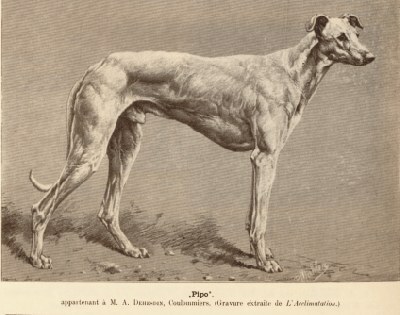 The picture above shows a "Persian Sighthound" from Iran, as it was named at the time. The Saluki is also referred to as the Persian Sighthound. According to Lady Amherst a hundred years ago (4), these varieties could be told apart by native experts. In 1926 there were in fact two standards in Europe for the Middle eastern Sighthound, the English standard for the Saluki (smooth or feathered) and the standard for the Persian Sighthound (always feathered). They have however all been mixed in the breeding of the Saluki in English speaking countries, and one no longer uses the standard of the Persian Sighthound. Various versions of descriptions/standards for the North African Sloughi existed in Europe already by the end of the 1800s. The word slughi is also used to name Sighthound breeds outside of Africa and the Middle East. Saluki Khariji means "foreign sighthound"
Just like the words Sighthound, Windhund, Galgo, Lévrier, Chart, Agar, Tazi, the word Slughi/Saluki represents a group of different breeds and not a unique breed. In fact, it is like the word "greyhound" in English which can be a type of dog or a specific breed. Like in the European languages, an adjective added to the word specifies which Sighthound breed is meant. Florence Amherst (4), 1907, United Kingdom. “... a Saudi Prince was given while hunting last year in Tunisia a local hound, which I imagine Dr. Crapon de Caprona would call a Sloughi. The dog was brought back to Saudi Arabia, since it was a gift, but it was never used as it was not regarded a Saluqi Asil but Khariji (foreign)”. Carl and Kate Rodarty in a personal communication also related a similar reaction by a Sloughi breeder of the Sian Tribe in Libya, from whom they had gotten their first Sloughi Tagiurie el Sian, who upon his first encounter with the Rodartys' feathered Salukis said they were mongrels. 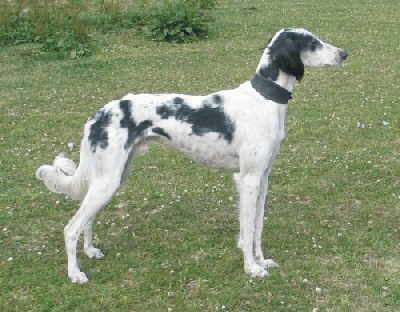 "Later sections [of Lady Amherst article] distinguished between the "Tazi', the 'North African or Saharan Slughi' and the 'Ahk-Taz-neet' or 'Kirghiz Greyhound', whereas today the Salukis of North Africa, Arabia, Syria, Persia are all recognized as being of the same breed of only two variaties, smooth-coated or feathered." Hope and David Waters (7),1969, United Kingdom. 1. Dominique Crapon de Caprona (1997): "Salukis, Saluqis, Tazis…and other Sighthounds, an answer to Sir Terence Clark", in Sighthound Review, ed. Bo Bengtson, issue Number 4 1997, Santa Barbara, CA, USA. 3a. Elias' Modern Dictionary (1981), 24th edition, Elias' Modern Publishing House & Co., Cairo, Egypt. 3b. Arabeyes-QaMoose dictionary English Arabic on line. Try translating "greyhound" into Arabic and compare with the word on the right of the Arabic expression at the top of this page. 4. Florence Amherst (1907): "Oriental Greyhounds" in the Cassell's New Book of the Dog, Vol.IV, Chapter LVI, Robert Leighton, London,UK. 5. Haan Jungeling: "Salukis oder Gazelle Hounds", page 538, in "Das Grosse Windhundeerbe" (1931-1932) Originalgetreues Reprint 1985, Kynos Verlag, Mürlenbach/Eifel, Germany. 6. Henry de Bylandt (1904): “Les Races de Chiens”, Æ. E. Kluwer, Deventer, The Netherlands. 7. Hope & David Waters (1969): "The Saluki in History, Art and Sport", David & Charles, Newton Abbot, UK.